Enlarge / These are the “imps” that you’ll use to manipulate worlds and objects in Dreams, whether you’re in an adventure or just goofing around in its editor mode. SANTA MONICA, California—Ten years ago, the LittleBigPlanet game series did the seemingly unthinkable for console players: it opened up the “mod and make your own games” experience that had previously been the domain of PC gaming. Its cute simplicity enabled a new audience to create (and share, via an online browser) their own 2D platform and adventure games, complete with higher-level concepts like if-then clauses, proximity triggers, and per-object logic. In 2015, LBP‘s creators at Media Molecule announced something even more ambitious: Dreams, a game that would do the same thing for the 3D-gaming world. Use controllers like a paintbrush, toggle through coding-command menus, and create your own 3D worlds, the Media Molecule devs promised. But thanks to a number of unclear media-event teases, we’ve gathered more questions than answers. Would Dreams really require those old, barely used PlayStation Move wands, as originally hinted during its 2015 announcement? How exactly would we build our own worlds and experiments? And would this PS4 product ever look like an actual video game? Though it still doesn’t have a release date, Dreams finally has something that (we’d argue) is more important: actual apparent gameplay that only requires standard PS4 controls. Unfortunately, Media Molecule didn’t provide screens of my fox-and-pig adventure tests described below. They did at least provide us screens of the mini-games I got to play, including this snappy two-player versus-game. Each player controls a hammer and has to bonk certain objectives in each round to win. Tight controls and snappy animations made this one a personal favorite. I walked slowly through this spooky hallway. This, like every other mini-game I played, was made using the same tools that gamers will have to use. This 2D sidescroller is actually rendered entirely in 3D within Dreams. Using filters and camera limits, players can turn it into a flat, cartoon-styled romp instead. Interestingly, this affords more stylized opportunities for 2D adventuring than LittleBigPlanet did. We were also sent screens of mini-games that we didn’t get to test, including this still-art shot built entirely using Dreams‘ tools (meaning, these aren’t pre-built pieces of 3D clip art). Dreams borrows from SS:SV by asking players to possess and dispossess various characters and objects in a miniature 3D world. You start as a floating “imp,” which you control by moving your DualShock 4 controller in physical space. The gamepad’s built-in gyroscope and accelerometer track your hands’ movement to guide your floating, glowing bulb-creature around, which means you do not need a PlayStation Move wand to get into Dreams. Press R2 whenever your imp flashes to grab and manipulate non-animal objects (blocks, trees), or do the same to living creatures in order to make them run around like a mascot platformer. (My demo’s host reminded me to keep my eyes on “the tip of the imp,” which would flash when something was manipulable; this phrase never failed to make me giggle.) Possessed creatures usually come with a few button-triggered maneuvers like jumps and attacks. Many of the levels will play out in “point-and-click adventure” fashion. The brief chunk of Dreams‘ discrete “campaign” that I played was equal parts adorable and moody, and the game’s visual engine, driven by a combination of repeating paint stroke textures and voxel-loaded geometry, was quite handsome—though that wasn’t surprising, since the game’s previous reveal events have all looked striking. The biggest surprise this time is that the content on offer ran efficiently on a PS4 Pro—an apparent near-locked 30 frames-per-second refresh in an admittedly unfinished build—whether the visible scenery was simple or vast. That’s all important stuff, Media Molecule developers note, because the entire campaign has been built using the same toolset available to Dreams‘ eventual paying customers. What kind of thing are we going to create? We’ll follow the green “imp” to a “game” section. 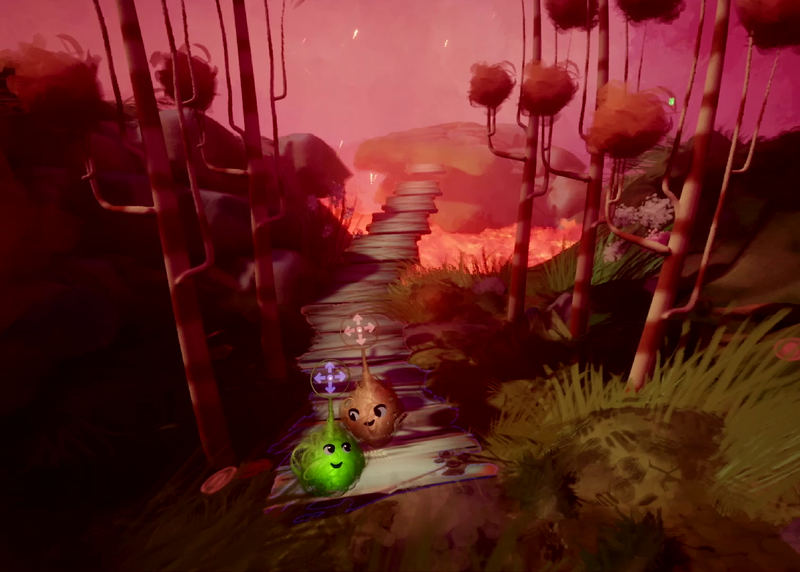 Welcome to Media Molecule’s pre-made landmass for this E3 demo. In this image, you can barely see imps starting to clone trees by grabbing them and pressing a controller shortcut. With the camera rotated (using joysticks), a question emerges: how can we cross that gap? Simple: we’ll clone a stone-ground object a few times and chain it together using our DualShock 4 as a motion controller. …and while the “clone” button is held down, we’ll rotate a joystick to create an attractive swivel effect for our new landmass. One tool lets you adjust the look of the world around you, by altering the paint strokes, colors, and lighting of the general sky. After changing to a red sky, we can grab the sun with our imp and move it to the opposite side of the sky (or pull it beneath the planet for a spooky moonlight effect). Scanlines, pixellation, chromatic aberration, and VHS-tape effects can be applied to the full scene as you see fit. Oh, shoot. There’s a gap from the bridge to the island. Let’s use the “action recorder” to make a floating bridge object. That yellow path is a recording of the tester’s controller motion. You can use this to record motions of any object in a Dreams world. Animation options allow us to loop, speed up, slow down, add wobble, and do other weird stuff to any object’s animation pattern. Unsurprisingly, Media Molecule will pack Dreams full of pre-made objects (just like they did for LittleBigPlanet). What’s the most dangerous thing we could add to this level? Lava. A big, stretchable and customizable lava pool, in fact. Only two pre-made characters were available in our pre-E3 demo, but this screen shows hints of a few more to come. Here’s a shot of the build mode’s “test” option, in which we run Foxy up to the bridge and make him jump on the floating part of the platform. Every 3D character, piece of terrain, musical composition, and animation in the game has been built using the same toolset available to Dreams‘ eventual players. We’ve seen bits and pieces of this creation system over the past year-plus at various events, but this latest pre-E3 demo was our first chance to actually test it out. Should players have a PlayStation Move wand and a PlayStation Eye camera, this part of the game is admittedly easier to manage. To make a scene, you’ll use some kind of motion controller to guide your imp around a scene and create dollops of material, which can be assigned as individual objects and manipulated accordingly. Each thing you create can be, say, a controllable object, a piece of a larger entity, a surface, or more, based on the logic attached to any particular blob. Controlling this object-manipulation system with only a DualShock 4 gamepad is manageable enough—that’s the only one we got to test—but you’ll have to learn a combination of joystick, d-pad, and trigger controls to whip around in all dimensions. A PS Move wand, on the other hand, affords simpler “depth” control (meaning, pulling objects closer to or farther from you, relative to your position). I was able to mold a simple surface in a level, then manipulate its size and rapidly copy-and-paste it to create a chain of surfaces or objects, like a long bridge. The copy-and-paste mechanic looked particularly cool when I grabbed a pre-drawn tree and then made a fan-blade chain of eight of them side by side to make a quick, cute forest wall. I was then told how to create a distant island and build a dangerous pool of lava in the gap between that new island and a level’s existing land mass. In order to Mario-jump my way over there, I had to build an animated platform. Doing this was pretty cool: after switching to the game’s “build” mode, I grabbed the platform, toggled a “record animation” button, and moved my DualShock 4 controller in real space. My exact hand motion—first slow and jerky, then smooth, then rapidly up and down—was saved, replicated, and looped back and forth in the game. I had created a floating bridge. If I wanted to, I could go back and re-record my hand motion, and I was also shown a moment-by-moment chart of my motions to fine-tune the bridge’s exact timing and X-Y-Z coordinates. Should you not want to record your own samples or sound effects, a giant “Instant Gratification” folder will help you build music in the game. Buzzing away with a metronome turned on. When you replay a song experiment, the “notes” will flutter toward the sound window in handsome fashion. We only saw a tiny taste of a more elaborate sound editor during our demo, and we’re hopeful it’ll let us more precisely arrange notes. It was very difficult to get our button taps to match the beat of our metronome. …which are easy to insert and loop into a sound composition. Many objects in the game can have trigger zones built. This “proximity” sensor will play our weird song once a character runs through that invisible trigger globe. I also got to “compose” music for this level by loading a metronome and a floating “sound field” window on which I could draw musical notes. This music-creation tool, sadly, was far too unwieldy in a brief demo to make anything that actually sounded coherent or rhythmic. After I complained about this tool, my MM demo rep showed me a far more customizable timeline tool on which I could draw exact notes, using a giant pre-built family of sound samples. She promised that I could also use a headset microphone to import my own recorded voice and samples. All of these note and sample arrangements can be easily looped and repeated, and the DualShock 4’s touchpad (which few games really use these days) will afford on-the-fly sound tweaks like note-bending. The best I could say about my brief build-a-level demo was that it included a tasty mix of simple grab-and-manipulate options so that novices can feel good remixing existing 3D levels and tab- and option-filled submenus to open up all kinds of logic, animation, and trigger options. If I want a bridge to start moving, a song to start playing, and a lava floor to expand beneath a player’s feet, I can toggle all of that with an “if player enters sphere, then things happen” trigger. My rep showcased a range of levels that had been built by various MM staffers ahead of our pre-E3 event, including a stylized 2D platformer, a two-player mini-game competition, a free-range arcade space shooter, and a spooky walk through a dark woods. These were all anchored with an enjoyably floaty control base—think LBP‘s spongy jump-and-run style but perhaps a smidge more responsive—but each included a decidedly different gameplay feel, especially the mini-game versus challenge. Additionally, one MM rep talked about using Dreams to draw and design ideas for a wedding reception space to share with their partner. Another described a 3D adventure about a banana being chased by a velociraptor—which was admittedly built using a ton of pre-made characters but opened up the non-developer staffer’s ability to focus on a cinematic presentation. In both cases, MM appears to already have a meaty base that builds upon the hand-controlled creative fun of VR hits like Tilt Brush. Dreams players will be able to dive into similar, hand-tracked fun without needing anything more than a standard DualShock 4 (though Dreams will support PlayStation VR, as well, with info about VR-specific features coming “in the future.”) It’s all looking like good news for anyone hoping Dreams will either ship with a killer, LBP-caliber campaign or will include robust PlayCreateShare tools to make a good-enough game in the developers’ stead. We’ll keep our eyes on next month’s E3 in hopes of a release date.